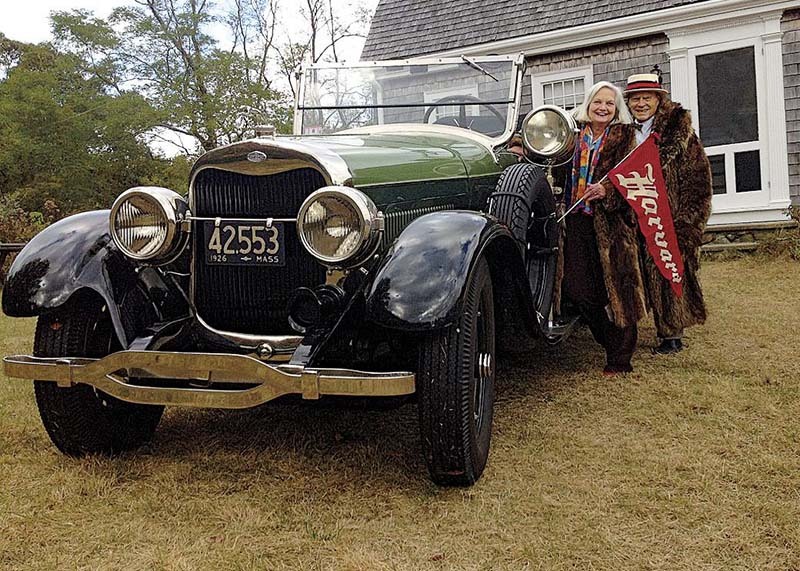 Robert Norton Ganz Jr. and his wife, Anne, give pride of place to his 1925 Lincoln convertible. Photograph courtesy of Robert Norton Ganz Jr.
Eric Lingard. He died of pneumonia in October 1918 after his plane crashed at sea. On the morning of July 21, 1918, a German submarine surfaced three miles off Nauset Beach in Orleans, on Cape Cod, and attacked an unarmed tugboat towing four barges. Shells from the sub’s deck guns sank three of the barges and set the tug ablaze. Coast Guard lifeboats hastened to rescue crew members, and seaplanes from the Chatham Naval Air Station arrived to dive bomb the sub. A laying hen on one of the barges was discommoded as she bobbed to shore in her coop. No one was killed, but two of the tug’s crew went to Massachusetts General Hospital for repairs. The attack wasn’t worth the Germans’ effort and the large quantity of ammunition expended because three of the barges were empty of cargo and one was full of rocks, but it brought fame to Orleans: a few German shells landed on Nauset Beach, giving the town the distinction of being the only spot in the United States to receive enemy fire during World War I. 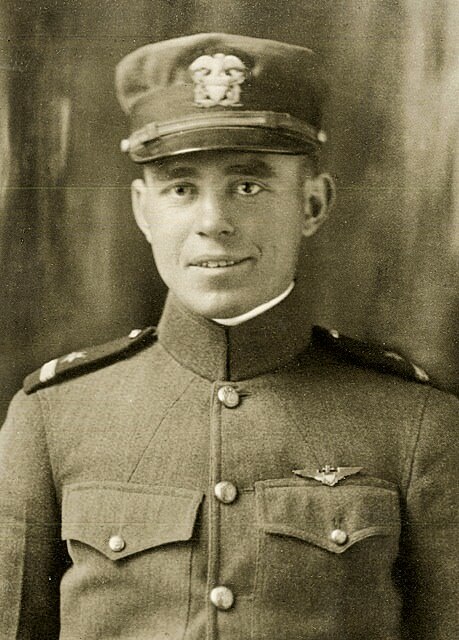 According to Jake Klim, author of Attack on Orleans: The World War I Submarine Raid on Cape Cod  (History Press, 2014), the hero of the day was 26-year-old ensign Eric Lingard ’13, former Harvard football star, ice-maker, and shipbuilder turned aviator and pilot of a flying boat. On that hot, hazy morning, Lingard raced to Chatham’s Naval Air Station and took off with his two-man crew even though their seaplane had crankshaft problems and no one knew how long it would stay airborne. Chief special mechanic Edward Howard sat in the bow, ready to drop their single Mark IV bomb, a 55-inch-long proposition loaded with 120 pounds of TNT. When Lingard got the airplane perfectly positioned over the sub, Howard pulled the release, but the bomb stuck and would not leave its mount. Lingard circled, but a second attempt to drop the bomb also failed. Howard then climbed down to the lower wing of the plane, where the bomb was housed, and took the weapon in his arms as Lingard maneuvered. As the plane came in dangerously low, under fire, Howard let go of his bomb. But when it hit its mark, smack on, it failed to explode. ready for the game: One can see that Robert Norton Ganz Jr. ’47, Ph.D. ’59, and Anne, his wife of 51 years, are well equipped and well dressed for an upcoming Harvard-Yale football match. Robert bought the 1925 four-door Lincoln convertible (born the same year he was) in 1957 on Martha’s Vineyard—where the Ganzes have now retired, to Chilmark—and drove it to Yale, where he was both teaching English literature and finishing his Harvard doctoral thesis on Robert Frost. He couldn’t get a comb through his hair for three weeks after that drive, he says. He has in his barn on the island a one-cylinder 1909 Cadillac—a one-lunger, he calls it—also open to the elements.